If you are itchy to enjoy your patio or backyard this Spring and Summer then refresh your space with new Adirondack chairs. This Amish Folding Adirondack Chair ships fully assembled. If you have limited space or want to easily rearrange your outdoor living space then consider our outdoor folding furniture. This Adirondack chair and the optional matching end table both fold up for easy storage. You can also order the optional ottoman for a comfortable spot to rest your feet. 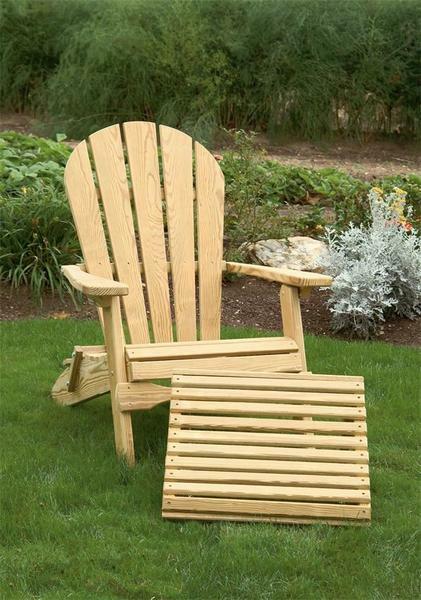 This Pine Adirondack Folding Chair is Amish handcrafted in the the heartlands of America. Order a dozen Adirondack chairs for parties and events and easily set up for outdoor entertaining and then store away after the party. Call one of our Amish outdoor furniture specialists today with questions on planning your outdoor space or to order over the phone. They are happy to help in any way that they can. You can also stop in our brick and mortar Amish furniture store if you happen to be in Sarasota, Florida. We would love to meet you and help you plan your dream outdoor space for the season.